Today we are talking about that voice inside you head. 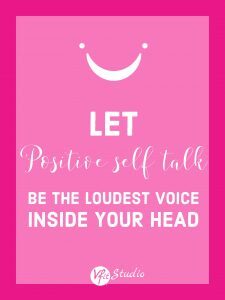 Imagine what it would be like if you let POSITIVE self talk be the loudest voice in your head each day. Alright, we hope we aren’t losing you already with this one. Voices in our heads? But you know what we are talking about. That teeny tiny (or at times BIG and LOUD) voice that comes up during the day as you go about your business. If you aren’t sure what we are talking about, take the next 24 hours to take notice of just how many times that voice pops into your head. Then come back and read this post. We are willing to bet, that inner voice is guiding more of your day than you realize…..
// You see a pile full of dishes in the sink and you groan at the thought of having to do them all. // You look at your to do list and you want to crawl back under the covers, hoping it does itself by tomorrow. // Your fitness trainer asks you to hold a plank and before you even hit the ground, all you can think about is how long is this going to take – will I be strong enough? // The pile of dirty clothes is never ending and for once you just wish there was NO more laundry to do. Any of the above strike a chord? Well TODAY, right here, right now, we want you to take a moment and flip the switch with that voice in your head and turn up the positivity. It is usually as simple as adding in an “I get to,” “I can,” and “I will” into each thought. // Dishes in the sink – look at that pile! I have a roof over my head, the means to buy groceries, and the food to make nourishing food for my family. I’m able to move my body freely, have hot water in my home and purchase soap, and I get to wash those dishes, so that they are ready and available to me for the next meal I have in my home. // The mountain of a to do list – my day is full! There are so many projects and tasks I can take on today to make my life fuller. I’m a capable woman who is going to take on breakfast, projects with my work (in the home or through work), to launder the clothes that I have the means to purchase and own, and cap off the night under my own roof (possibly right next to your significant other and family in tow!). If there are things on your to-do list that you truly do not need to do and bring nothing of value to your life – YOU have the control to sometimes just say NO and take them off your lists. But for everything else – be grateful you life is filled with so many opportunities to GET TO DO things throughout the day. // Fitness challenge in your workout – look at me go! I’m so awesome and strong! Not only did I have the intent to take a class, I had the will to follow through with my intention and SHOW UP FOR ME. I’m able to be a part of a fitness class, challenge myself from head to toe and when my trainer hands me challenges – I am grateful for the opportunity to grow stronger each class and improve week after week. The joy is in the journey and it’s ok if I can’t do everything today – I SHOWED UP and I CAN sure as heck try my best. I love my body and I’m proud of myself for honoring it! Starting to feel a little better already about your day and what’s next? Today we are giving you the 72 hour #POSITIVEMINDSET challenge. For the next 72 hours, try and change your inner voice to be POSITIVE! It’s ok if you aren’t perfect, we aren’t either. But what an eye opening challenge this is and by the end of the 72 hours, we hope you find that by adding in more positive self talk, the negative talk will start to be crowded out. Your brain is THE most powerful muscle in your body. Use it to its best and train it daily and often. This is a surefire way to boost your morale each day and that positive feeling with spill over into EVERY task you conquer and it’s even known to be contagious to those around you. Be sure to check back in with us after the 72 hours and let us know how this exercise worked for you. And if you are already shrugging this challenge off – we hate to say it, but you may need it most!